Request that Secretary Redfield meet with the National Independent Political League regarding the Department of Commerce. I write on behalf of a Committee from the National Independent Political League to ask that you kindly designate an hour between now and Saturday of this week, (if it is possible for you to do so) when said Committee may see you for twenty minutes on a matter pertaining to the Department of Commerce in which we think you will be interested. Waldron, J. Milton, “J. 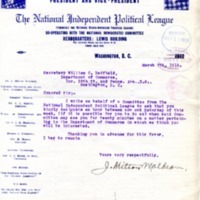 Milton Waldron to William C. Redfield,” 1915 March 9, SC030915a, Race and Segregation Collection, Woodrow Wilson Presidential Library & Museum, Staunton, Virginia.